George, Amarilla and their daughter Grace are featured in the 1895 census for Minnesota. The 1880 U.S. Federal Census was rather vague and the 1885 spelled names wrong so this 1895 census was the only one that showed them together as a family. I have posted about George the census in past posts. Line 13, Barclay Geo. A, age 51, born in Conn., occupation [Lumberman], 12, sold, no, no, no. Barclay, Ammarilla, 37 years born in Iowa. Barclay, Grace A., 13 years born in Minn. Source: Geo. Barclay Family, 1895 Minnesota State Census, Twp. 137 Range 29W, Cass Co., Minnesota, Schedule 13 pg. 1, FHL #0565765. When I went to source this census, I had a bit of a fright because the actual page looks like Twp. 127 rather than Twp. 137. I therefore went to Family Search and double checked the film number to make sure I was not wrong. I am happy to report that I am now correct with both FHL and Ancestry. When I first started doing genealogy I was not very good at sourcing so a lot of the older research needs updating. I do remember looking at the film for this particular census and probably doing that research at the Minnesota Historical Society at that time using film. 6th line down: Barklay, Alexander A. 52 years, Male, White, born Conn. 40 years in area, 4 years?, farmer, 12, sold, yes, yes, yes. Below him is Giles, Fannie B. 73 years old, female, white, born Mass, housekeepr, 12, no, no, no. Source: 1895 Minnesota State Census, page 3, Lakeville Twp., Dakota Co., Minnesota, P.O. Farmington. Family #54: Barclay, John, age 94, male, white, born in Scotland, Resident of state 45 years, 45 years in enumeration district, occupation none, mother and father both of foreign birth. Barclay, Ellen, age 65, female, white, born in Norway, both parents of foreign birth. Barclay Charlie, age 35, male, white, born in Minnesota. In state and enumeration district 35 years, a farmer, employed 12 mos of the year. Both parents of foreign birth. Source: 1895 Minnesota State Census, Eagle Creek, Scott Co., Minnesota, pg. 2, schedule #5, enumerated on 10 June 1895, FHL#565810. This will be the last census that George (died 1898), Alexander (died 1905) and John Barclay (died 1897) all appear in. Even though Alexander lives till 1905 I have not been able to find him in the 1900 census nor the Minnesota state census of 1905. A Tragedy: An Accident – Baby George Dies! For many years I did not know how little baby George died. I had been to the cemetery and viewed his tombstone next to his father but I didn’t understand why he had died so young? On my last trip to Minnesota in 2007, I found a brief article in the Brainerd newspaper that described the whole ordeal. George Alexander was only 18 months old. He died on the 19th of June 1881 on the way to Brainerd from Pine River. Apparently he drank some German Cough balsam that was filled with probably codeine and his little body could not handle the amount of narcotic and he died en route probably in his mother’s arms as George tried desperately to get them to Brainerd and get help. They were too late. There is no mention of the death of the baby in the Whipple papers at the Minnesota Historical Society (Methodist Episcopal). The papers are very difficult to read and I have actually looked at them twice to see if I could make out anything else. The article appears in the Brainerd Tribune, Saturday, June 25, 1881 under Local News – Death of Baby George A. Barclay. 1) Mr. and Mrs. G.A. Barclay desire to express their heartfelt thanks to the citizens of this place for their kind sympathy and attentions manifested during their recent bereavement, and for the assistance rendered during the last solemn rites at the funeral of their lamented child. 2) A sad occurrence transpired in the family of Mr. George Barclay, postmaster at Pine River, last Saturday. Their infant child, about seventeen months old, had in some manner got hold of a bottle of German cough balsam , and drank the whole of it. No physician being nearer Pine River than Brainerd, Mr. and Mrs. Barclay immediately started with the child for this place. But the effects of the potion were to speedy, as just upon arriving in town the child expired. This is a very severe blow to the bereaved parents, and the sympathies of the community are heartily enlisted in their behalf. The remains were interred in the Brainerd cemetery on Monday. George Alexander is buried in the Evergreen Cemetery in Brainerd, MN location: Center N 1/2 Lot 17 Block 7. He is next to his father and mother, George and Amarilla Barclay. Sacred to the memory George A. infant son of G.A. & A. Barclay died June 19, 1881 1 yr. 5 mo. 9 days. Underneath this stone do lie as much virtue as could die which when alive did vigor give to us much beauty as could live. There is a little lamb on the top of the tombstone. 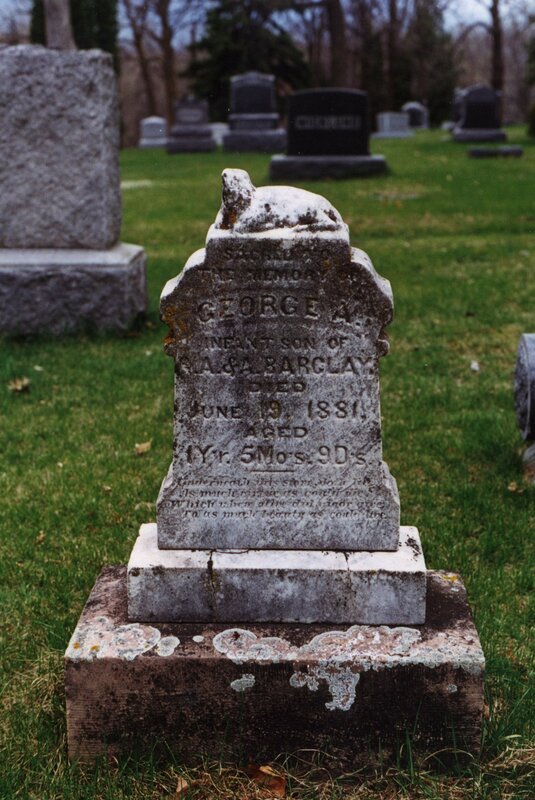 This tombstone is to the right of the father, George A. Barclay in Evergreen Cemetery in Brainered, MN. Barclay, George, male, 30 years old, husband, tavern keeper, place of birth unclear. Under George’s name is written wife, age 26 place of birth not indicated, child age 7/12, male born Minnesota. The wife is keeping house. This census is not very clear and lists the family members under George as “wife” and “child” with no names given. We do know that George has a family started and is living in Pine River. Along with George and his family there are two other individuals: John Eins age 32 and Thomas [Nourling] age 62. Both men are helping in the Tavern. John is from Norway and the other is from Kentucky. There is only one page for Pine River listed for this census. The Chippewa Agency (21), Clayton (18), Gull Lake (19) and Gull River (135? ), Hay Creek (2), Leech Lake Indian Reservation (6), Not stated – Twps 139 and 140 with 9 pages with children and wives listed (200+), Pelican Lake (3), Pillager (18) , Pine River (5) and West Brainerd (36). The birthplace given for George is also obscure and has the word “Native” written above another scribble that is very faded and difficult to read. It might indicate he refused to answer or more likely he wasn’t home? The listings from the above census enumeration districts had lots of families listed but most of the population was north of Pine River. George and Amarilla settle in at Pine River. George helps out the settlers before the county was organized in 1897. He is given credit under the Cass County Commissioners for his assistance. Source: Cass County Heritage, Cass County Historical Society, Taylor Publishing, 1999. Source: Record of Appointment of Postmasters, #M841, Roll 63 NARA, Minnesota Counties Aitkin-Faribault Co., Target 14, Cass County, Vol. 39, ca 1871-81, Vol. 57 ca. 1881-1892, Vol. 84 ca. 1892-1930. George A. Barclay was appointed the postmaster for Pine River in 1877 and continued till his death in 1898. After him came Edward Coyle 5 Jan. 1899, James R. Kinler May 4, 1899, Eddie J. Holman Mar. 21, 1906, W. P. Stervant 24, Apr. 1914, Elmer Dahl, Irvin Lembke, Dec 2, 1924, Oliver Dahl Oct. 16, 1924 to 1930. A little over a year after his marriage to Amarilla, George obtains another patent for land. It is interesting that George states he is from Hennepin Co. and not Cass Co. The Deed Mapper software does not do 21/100ths so what you see is an approximation of the patent of 41 and 21/100ths of an acre. We are now carving out the town of Pine River as George adds to his land holdings. So far we have about 233+ acres of land totalled for George A. Barclay at this time. We still have more to go and we have not addressed deeds. Below are two (2) patents that were assigned to George A. Barclay in 1874. They are located in Section 6, Township 137, Range 29. Section 6 is located in the northwest corner of Wilson Township in Cass County, Minnesota. Most of the city of Pine River, Minnesota is located in the northwest corner of Wilson Twp. T137 R29. 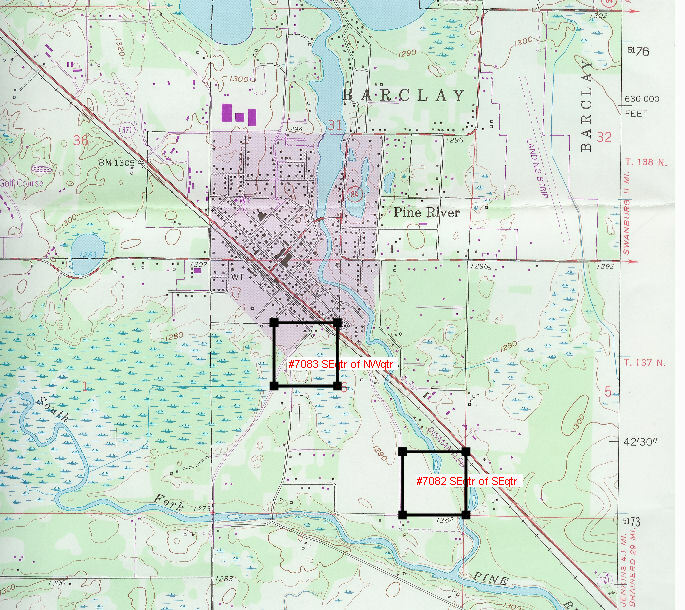 To the north is Barclay Twp., T138 R29 and Pine River is in the southwest corner. 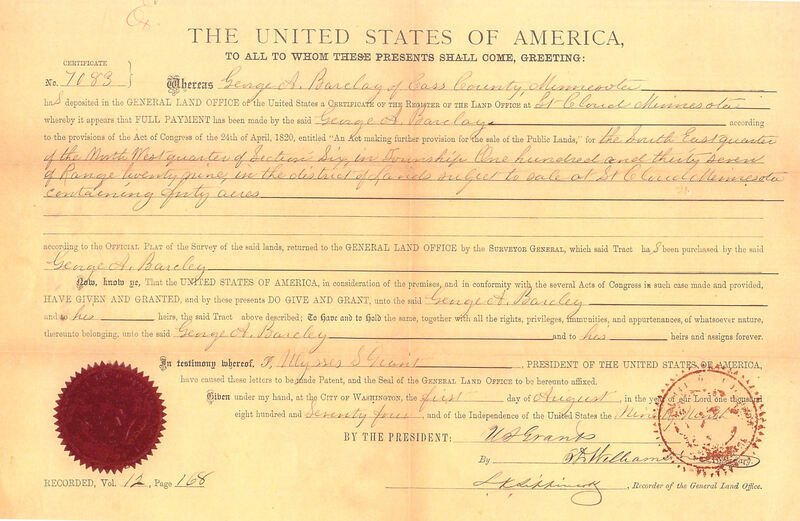 Patent: George A. Barclay of Cass County, Minnesota, Register of the Land Office at St. Cloud, Minnesota. The southeast quarter of the southeast quarter of section six in township one hundred and thirty seven, of range twenty nine in the district of lands subject to sales at St. Cloud, Minnesota, containing 40 acres, signed by U.S. Grant, 1 of August 1874, etc…(Cash Vol. # 166, Page # 167). Cash Entry Folder Jacket: Reg. Sept. 21, 74 rect. ackd. October 3/74 – #7082 Cash Entry, Land Office at St. Cloud, Min. Sec. 6, Town. 137 Range 29. [Aff o June 20/74. F.O.B., Pd August 7th, 1874, Rec Vol. 12, Page 167 Ex . Notes in Tract book 3/20/34 JGS. Vol 35 g123 – Sec to S/G F. Alderman, Brainerd, Minn Sept 22/86. #7082 Receiver’s Office at St. Cloud, Minn. May 22, 1874, Received from George A. Barclay, of Cass County, Minn. the sum of $50.00 dollars and — cents, being in full for the SE4 SE quarter Section No. 6, Township No. 137, Range No. 29 containing 40 acres — at $1.25 per acre signed by J. V. Brown Receiver. #7082 Land Office at St. Cloud, Minn, May 22, 1874. It is hereby certified …George A. Barclay, Cass Co., State of Minn on this day purchased of the Register of this Office, the lot or SE4 SE4 Section no. 6, in Township No. 137, of Range No. 29, containing 40 acres at the rate of 1 dollar and 25 centers per acre amounting to $50 dollars and — cents for which the said George A. Barclay has made payment in full as required by law George A. Barclay shall be entitled to receive a Patent for the lot above described signed by H. L. [Lovelace] Register. The photo above of Patent #7083 is a copy of the original patent. It is the only patent that survived to this day of all the patents George purchased and is in the possession of my cousin. She shared it with me. Cash Entry Folder Jacket: # 7083 Cash Entry, Land office at St. Cloud, Minn Sec. 6, Town. 137, Range 29, [App] o June 20/74 F.O.B., Pd August 1st 1874. Rec Vol. 12, Page 168 Ex. Notice in Tract Book 3/20/34 JGS, Vol. 35, Pg. 123. Other side: Pat. August 1, 1874, Vol. 12, Page 168. #7083 – Land Office at St. Cloud, Minn, May 22, 1874. It is hereby Certified that in pursuance of law George A. Barclay, Cass Co., State of Minn, on this day purchased of the Register of this office, the lot or SE4 NW4 of Section No. 6, in Township No. 137, of Range No. 29, containing 40 acres at the rate of 1 dollar and 25 cents per acre, amounting to 50 dollars and — cents, for which the said George A. Barclay has made payment in full as required by law….George A. Barclay shall be entitled to receive a Patent for the lot above described signed by H. L. [Lovelace] Register. The patents in bold dark lines were created using the software Deed Mapper a product of Direct Line Software at: http://www.directlinesoftware.com/ This software is used mostly for complicated state land states like Virginia. However, it does do a perfect patent for a Federal land state like Minnesota. 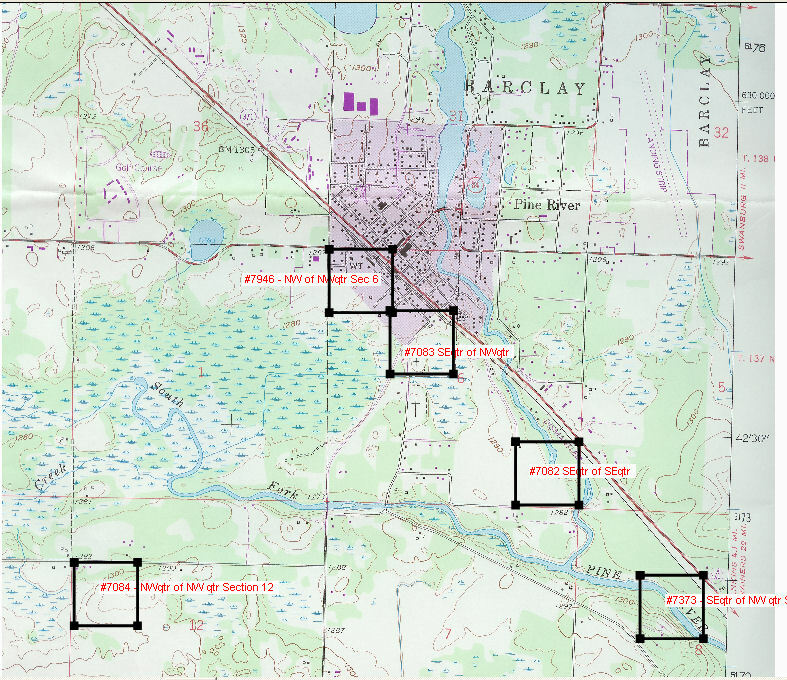 The patents are approximate to the topo map Pine River Quadrangle, Minnesota, Cass Co., 7.5 Mte Series Revised 1994. Over the next series of posts I will build on this map of patents for George Barclay. Click on the map to make it larger so you can see it better. Please note that preparing these patents has not been an easy task. It can get very confusing. So please refer to previous posts that explain how to read a patent or deed. I am not claiming that I have it correct so if you think there is a problem write me a comment. Just click on the title of the post and it will bring up a page where you can write a comment. The other option is to just click on “Leave a comment” highlighted at the bottom of the post.